In the fictional town of Holt, Colorado, one woman despairs of life of spinsterhood that awaits her after a scandalous love affair while another is awakened to the shallowness of her relationship with her boyfriend. Across town, the desperately unhappy son of a minister wants only one thing – to escape this town and return to his former home in Denver. They all have cause to regret missed opportunities and lives that could have been different. In the midst of all these stories is Dad Lewis, the elderly owner of the town’s hardware store. The novel opens with the news that he has terminal cancer. He leaves hospital knowing he has one final summer of life ahead. As he waits out his remaining weeks he takes an inventory of his life; weighing up the success of his 50 year marriage and his business against his failure as a father. … somebody straight up and down like the hands of a clock…. somebody you could depend on, somebody to trust completely. This is a man who sets high standards for himself and those around him; a man not afraid to take hard decisions even when they meant hardship for others, but also a man with a good heart, doing what he could to support his neighbours. For years he secretly supported the widow and son of an employee he was forced to sack for stealing. Now as he lies dying he puts arrangements in place to help an elderly woman with her gardening and household chores. The one ghost that continues to haunt him is his troubled relationship with his estranged homosexual son Frank. Split by anger and misunderstanding they have not seen or spoken to each other for decades. Is it too late for them to make their peace and for Dad Lewis to find redemption? This isn’t a novel in which a tremendous amount happens. The focus is really on the little dramas of life, or as the town’s Minister describes it “the precious ordinary of life that passes without their knowing it”. It’s told in an economical style devoid of figurative language but shot through with richly evocative descriptions of landscape and the heat, wain and wind that sweep down on Holt from the Colorado plain. Haruf’s prose has a quiet power that infuses fairly ordinary actions, turning them into something more grand. There is one wonderful scene for example where three generations of women shake off their inhibitions to skinny dip in a cattle water tank. Haruf suffuses the joy of the physical action with the air of a baptismal celebration. 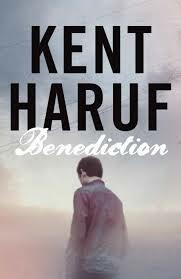 Benediction, published by Picador, is Haruf’s third novel set in Holt. It’s shortlisted for the inaugural Folio Prize, the winner of which will be announced on March 10. There’s a good interview with Haruf in the Independent newspaper in which he talks about some of the locations and settings that inspire his writing. Posted on March 9, 2014, in Book Reviews and tagged Folio Prize, Kent Haruf. Bookmark the permalink. 5 Comments. Ooh, sounds like a wonderful book. Must try to pick it up sometime. i’d never heard of this author before this book but he seems to have a very loyal set of followers. Oooh, this is on my TBR! It’s rare that I find someone else has the same book as me! think of yourself as being in very elite company – why do what everyone else does?